The widely-held belief in a Queen’s chain providing universal access to the coast above the high water mark is largely a myth. 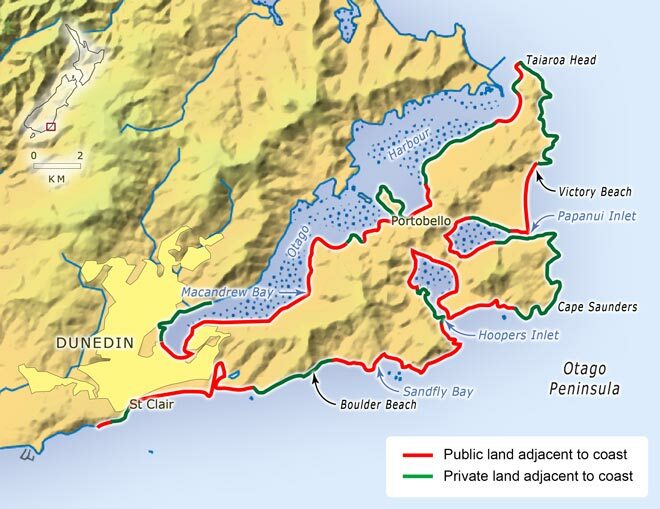 In this map of the water margins along Otago Peninsula, the public land represents 66.71 kilometres or 61.6% of the coastal strip. The rest is in private ownership. Even in the publicly-owned land, 32.19 kilometres (29.8% of the total) have restrictions, such as a sea wall, or steep topography, which make access impossible.